23a. [Biography of Ebenezer Scrooge? ], MARLEY AND ME. 34a. [Biography of Archimedes? ], LIFE OF PI. 92a. [Biography of the Venus de Milo? ], A FAREWELL TO ARMS. 110a. 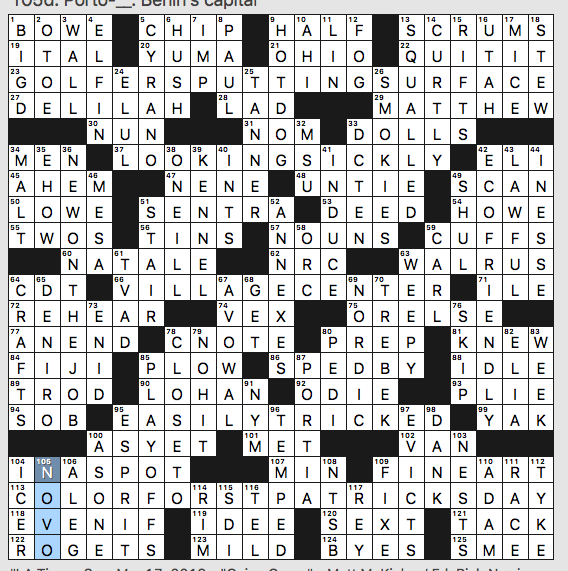 [With 112-Across, biography of Elvis? ], THE ONCE AND / FUTURE KING. 4d. [Biography of Thomas Crapper? ], A GAME OF THRONES. Have a seat, make yourself at home. 13d. [Biography of Willie Mays? ], LORD OF THE FLIES. I gather Willie Mays is known for something to do with fly balls? Yes, my husband confirms that he had a knack for catching fly balls. 43d. [With 44-Down, biography of Walt Disney? ], OF MICE / AND MEN. Mildly off-putting to have two more pairs of Across 8s besides the themers in the 5th row of the grid, but at least STOOD OUT, OPEN LATE, GANGSTER, and RIM SHOTS are all good fill. 1a. 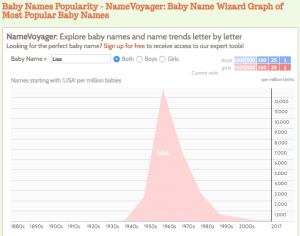 [Most popular baby girl’s name of the 1960s, per the Social Security Administration], LISA. 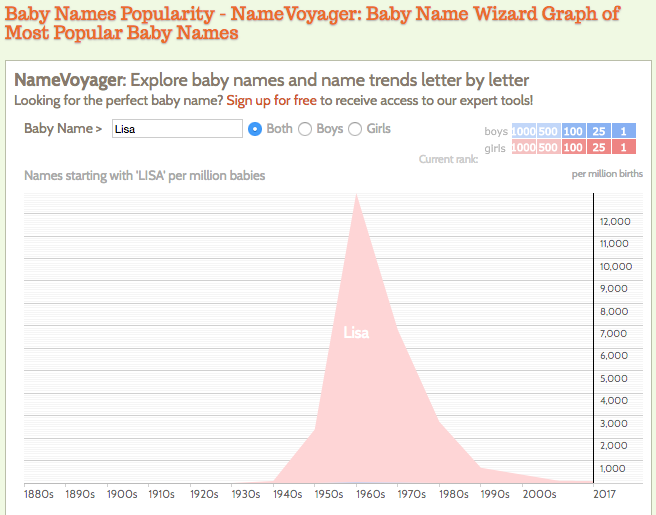 You hardly ever see kids named Lisa these days. The charts for Amy and Julie look a lot like the Lisa one. 90d. [Why parodies can’t be sued for copyright infringement], FAIR USE. Important concept to understand. 12d. [Elvis Costello hit that starts “I’ve been on tenterhooks / Ending in dirty looks”], PUMP IT UP. Here’s a performance video from 1978. Yes, Elvis Costello used to be a lot younger. 3d. [They create soft c’s and g’s], SILENT E’S. Sing vs singe, zinc vs since. Not so much silent E’s as bossy E’s. The wearing o’ the green is in short supply in this puzzle, but not on the streets of Chicago. We’ve got 19a. [Bit of greenery], SHRUB / 56d. [Certain green energy producers], WIND FARMS … and that’s it. Totally fine by me. 55a. [Get a Venmo request, say], OWE. Venmo, if you you don’t know, is a mobile app for sending and receiving money. 88d. [Like the phase ending after 12], PRETEEN. Had to work a lot of crossings here before grasping that “after 12” referred to the age and not noon or midnight. 4.25 stars from me. I enjoyed the theme and the general crisp modernity of the fill and clues. 17a Study of a TV chef’s behavior? CHILD PSYCHOLOGY–Think Julia. 26a Study of DJs’ physical structure? RADIOBIOLOGY–One word, this. 45a Study of a Houston batter’s swing? ASTROPHYSICS–Also one word. 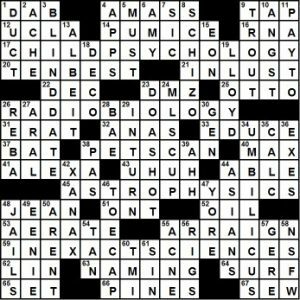 59a Fields that aren’t precise, or a hint to 17-, 26- and 45-Across INEXACT SCIENCES–Hmm. I’m puzzled. First, I look for evidence to extend the puns. Last week I assumed cover band meant cover band, and it turned out to signify that non-cover bands’ names were found in the starting and ending letters of the theme phrases. Ouch! Exact science is a term that is in the dictionary. Inexact science, not so much, but I will assume these two terms to be opposites. I’m not going to write a lot here; a scientifically proficient person will enlighten me. The definition I highlighted says physics is an exact science. I would assume astrophysics to be a branch of physics and, therefore, also exact. I know psychology is an inexact science. But I thought biology, and thus radiobiology, was exact. Or does the word inexact just sorta refer to the fact that the punny definitions create an inexactness by their nature? TEN BEST has a green paint feel to me, but it’s been used before. PET SCAN across the middle with a punny clue almost enticed me to try to treat it as part of the theme. ARRAIGN is a word everyone ought to know (said he, who arraigns about 200 people per week). Also BLIND DATE, TOE CAP, DO A SHOT. And then there’s IN LUST, which, per the Ginsberg database, has not appeared before in a crossword. A tip of the hat to Ross for that one. Based on that title, I thought we were having a Yosemite Sam themed puzzle for St. Patrick’s Day. Nope! Instead, another super-tight clever holiday theme. 22A [*Nickname for a Houston NFL pro?] TEXAS PANHANDLE. Get rid of ASP, and what’s left is TEXAN HANDLE, which jibes with the clue. 39A [*Long voyage for an expert fighter pilot?] A SPACE ODYSSEY. Or ACE ODYSSEY. 57A [*Wing built for a theatrical company?] CAST A SPELL becomes CAST ELL. 84A [*Drink served during a future PhD’s test?] GREW A SPINE. But the PhD candidate definitely prefers G.R.E. WINE to help ace that test. 96A [*Actress Halle, when she’s acting sadder than normal?] BLUE RASPBERRY is not as sad as a BLUER BERRY. 54D [*Wedding band made by Apple?] ASPIRING. But Apple makes the iRING. 45D [*Third of the most commonly seen characters in “Gridiron Gang,” e.g.?] LAST GASP becomes LAST G.
131A [Snake that you must banish from eight answers to make sense of their clues] ASP. 70A [Banisher of snakes celebrated on Mar. 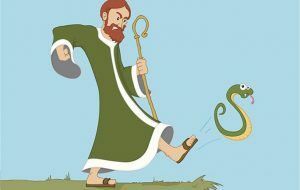 17] ST. PATRICK. Was there ever a better pic that summed up a puzzle? There’s plenty to like here… even if CAST ELL or G.R.E. WINE induced a playful eye roll. 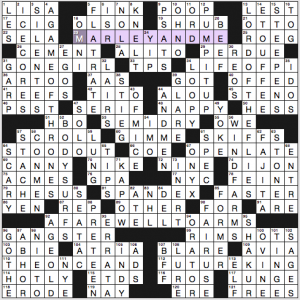 I like the “backwards” nature of the puzzle- where the base phrases are the actual entries and the solver is scratching his/her head trying to make sense of why TEXAS PANHANDLE– which is clearly correct- makes any sense whatsoever for the clue. This led to a true AHA! moment for me as I snaked (pun intended) my way down to the SE and filled in ASP before I had all the themers in place. And wow! That’s a lot of theme! Perhaps the two down themers weren’t necessary as they’re a bit more basic than the others, but hey… it’s cleanly filled (okay, coulda done without SEAU) so… why not? Had a heck of a time finishing the SW corner, mostly because I refused to change ME TIME to TV TIME. Overall, fantastic puzzle! And that title? Hilarious. It’s St Patrick’s Day, and the LAT is playing along! All the theme answers have the same clue: [Green]. 23a is GOLFER’S PUTTING SURFACE. 36d is NEW ON THE JOB. 37a is LOOKING SICKLY. I’d prefer LOOKING SICK but that’s pretty picky. 113a is, finally, COLOR FOR ST PATRICK’S DAY. An adequate and timely theme that wasn’t all that much fun to solve. 3d [Interactive Facebook feature] is the WALL. I thought we now had timelines instead of walls. 13d [Blew big-time] is not about losing a game. It’s wind; the answer is SQUALLED. 31a [Happy eating word] is NOM. This always makes me smile. 38d [1936 Literature Nobelist] took me way too many crosses to get, considering I wrote my undergrad thesis on Eugene O’NEILL. 72a [Try again] is the always annoying REHEAR. 85d [End-of-season games] is the PLAYOFFS. In baseball, they’re played after the season. Same in college basketball and football, as far as I know. What I didn’t know before I did this puzzle: that Porto-NOVO is the capital of Benin. There’s a reason why geography is one my worst Learned League categories. I’m not proud of this. Fun puzzle from Warren Houck today employing a classic sound change theme. THEME: Phrases that have a “CH” sound in them are altered by replacement of a “QU” sound. 24A [Monk who’s a Wall Street math whiz?] GREGORIAN QUANT. I was unfamiliar with the term “QUANT” and being that this was the first themer I uncovered, I thought I had something wrong… but no- QUANT replaces CHANT. 46A [“Choosing spuds requires a good eye,” e.g.?] POTATO QUIP. Instead of POTATO CHIP. 66A [Three stairs, often?] QUARTER FLIGHT. Much different than a CHARTER FLIGHT. 91A [Virus that affects your tax software?] QUICKEN POX. Love this one! CHICKEN POX is so last century. 115A [Mission to find a matching sock?] QUEST OF DRAWERS. Not CHEST OF DRAWERS. 36D [Left-bending lawn game shot?] CROQUET HOOK. Not CROCHET. 5D [Discus champions’ physics considerations?] OLYMPIC TORQUES. Bit of an awkward plural… even the base phrase doesn’t make much sense as a plural. OLYMPIC TORCHES? I only see one in my mind’s eye. 41D [Film about a large feather?] THE BIG QUILL. Not sure why it’s clued as a film- The film is in the base phrase (“THE BIG CHILL“)- the other clues reference only the alterations, not the bases. 54D [Talk about giving up?] QUITTER CHATTER. Bummer that the CH has to remain in the latter half of the answer. That’s a lot of theme and a lot of Q’s! As a person whose last name starts with a Q and whose name is impossible to anagram due to it (go ahead, you try… JIM QUINLAN), I fully appreciate the amount of work Mr. Houck must’ve put into this puzzle to make it work. While there’s a bit of weirdness as mentioned above, the theme answers are all fairly solid. Must’ve been a serendipitous moment in construction when OLYMPIC TORQUES worked placement-wise with QUARTER FLIGHT. 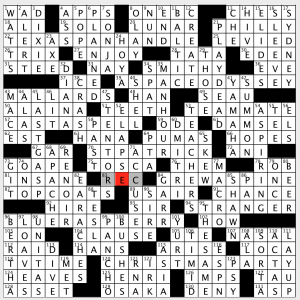 Mostly pleasant fill- but I have to object to the clue on 43D [Boastful winner’s cry]. I entered I WON, then erased it just as quickly because the word “winner” is in the clue, therefore the answer should avoid forms of that word, right? Thanks Family Guy for helping me out on 91D [Hard clams] QUAHOGS! P.S. I think this is a debut for Warren Houck! If so, big congratulations! This entry was posted in Daily Puzzles and tagged Evan Birnholz, Jeff Chen, Matt McKinley, Ross Trudeau, Sophia Maymudes, Warren Houck. Bookmark the permalink. Best NYT since…I can remember. Wish I could give it 10 stars. Excellent puzzle. Willie Mays is considered by many to be the greatest baseball player because of his great fielding as well as his batting and base running. After you’ve seen the Mays video, watch the next one. Scully doing Gibson’s World Series home run. NYT: Outstanding Sunday puzzle- entertaining without being silly. Erudite without being overbearing. Brava, bravo! For a second there, in response to “Girls” home, I had BRA. I guess not. I actually thought it was cute to have GONE GIRL and Girls home. 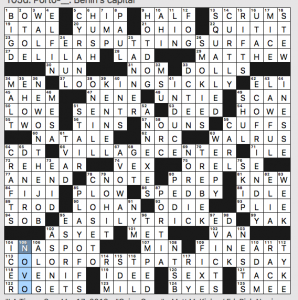 Nyt – I like when a puzzle makes me laugh ou loud and A Farewell to Arms did that for me. 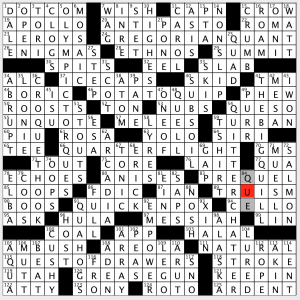 Glad you thought the title was funny, though it occurs to me that the clue for 4D in the Feb. 10 WaPo puzzle could have been an alternate title for today. Yes- that clue inspired my initial description of the theme in today’s write-up! What does an iRing have to do with weddings? With this “ring” “I” thee wed? The other answers I could groan at but understand [eventually … castell/cast ell took a loooooooong time], but I’m still mystified by the iRing clue. Apple makes the iPod, the iPad, iTunes, iCloud, etc. So, if they made a wedding band, it’d be called the iRing. Loved the NYT and the WaPo. Both were fun! I also really liked the theme for the Sunday Universal but there’s a glaring clue/answer dupe at 43d that annoyed me. The Universal daily has a dupe as well: 27d [Shrunken Asian sea] ARAL, 44d [Indians and Bangladeshis] ASIANS. Caught that in the write-up… surprised that got by without notice! In WaPo, can someone explain 45D – “Third of the most commonly seen characters in Gridiron Gang” is LAST G? The letter G is the most commonly seen “character” (meaning letter) in the title “Gridiron Gang,” and the third one is the last G.